I'm a huge fan of Flickr. I use it to publish galleries of images to augment my articles on The Digital Story, and to share photos just for the pleasure of showing them to other people. But I've discovered another benefit too. Flickr helps me determine the best image in any given group of shots. And often, it's not the photo that I would have picked. I think this perspective is wildly helpful because as photographers, we often decide that one image or another is our best based on information that the viewer doesn't have. And therefore we don't often feature our best images, as the world sees them. For example: just because you climb to the top of a mountain and endure hardship to get a particular shot, that doesn't mean it's your best picture from the trip. Yet, because of these factors, it might be the one that you promote. What Flickr does is give you actual viewing numbers for each shot in a set of images, and almost every time, one picture will rise above the rest. And for me, it's often a surprise. Keep in mind that you see the viewing numbers if you're logged in, but visitors don't. So they're not being influenced by the pack (although sometimes a site will link to a photo and that will jack up its numbers). I've began using this "Flickr feedback" when I decide which photos to share with clients or to publicize. By way of example, if you're going to Macworld, you'll see an image of mine from New York in the entry hall gallery. I offered that photo of The Kiss (along with others) in part based on its popularity on Flickr. Sure enough, that's what the selection committee at Macworld chose to feature. My point here is that we're often not the best judges of our own work. Using services such as Flickr provides valuable feedback to help us see our photos though the viewers' eyes without being tainted by our own personal experiences. If you want to learn more about the benefits of Flickr, and how to get better at using it, take a look at my Flickr Essential Training on Lynda.com. It's easy, fun, and comprehensive. 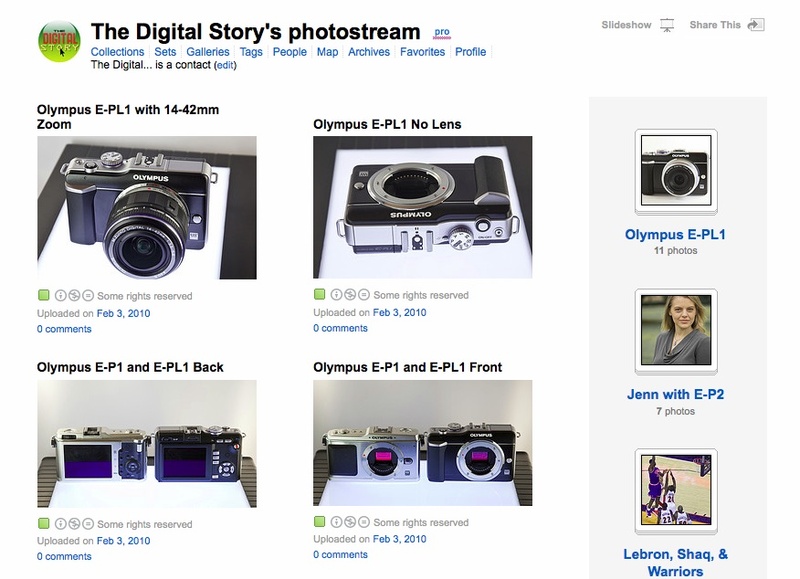 Derrick, my guess is the one without lenses that shows the mirror/sensor (Olympus E-P1 and E-PL1 Front). If that's the one, I'm not sure that means it's the best, though. It could just be the one that attracts the most curiosity, like "Whoa, what's that purple inside there?" I think the best is the Angle 2 shot with leaning lens cap -- it's the freshest and least like traditional product shots in a situation like this. I am also a huge fan of flickr and you have given nice use of flickr.This will be very helpful for me.Thank you very much for giving such a good information. Just a comment on Flickr that differs from what I understand you to be saying in the above post. if a visitor to a flickr blog expands the photo to full size, to the right of the photo is a bunch of information that includes the number of times the image has been viewed.